Covering an area of 490.3 km², Dudhwa National Park is set on the Indo-Nepal border in Lakhimpur Kheri District, Uttar Pradesh. Dudhwa National Park is a part of Dudhwa Tiger Reserve and plays a key role in maintaining the ecological balance of the area. The park is a paradise for bird watchers as they can spot around 450 different species of birds. Hornbill, Fishing Eagle and Serpent Eagle are some popular birds found in the park. 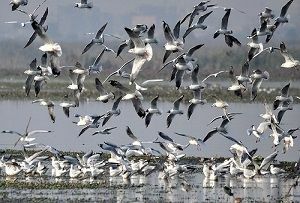 A number of migratory birds flock to the park during winter season. Other species found in the park include tigers, panthers, one-horned rhinoceros, leopards, barasinghas (swamp deers), Bengal Florican and Hispid Hare. Sparkling lakes and rivers add to the beauty of the park. These water bodies support wildlife like crocodiles, turtles, and Gangetic dolphins. The best time to visit Dudhwa National Park is from the month of December to February.